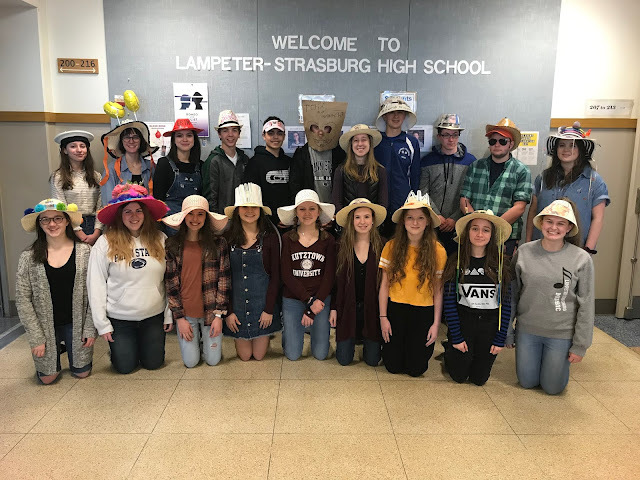 On Friday, the Lampeter-Strasburg High School Thespian Society inducted 13 new members. In a time honored tradition, inductees are given crazy hats to wear. New members include Ashley Crutcher, Steven Greenwood, Ethan Bare, Nick Blair, Logan Emmert, Mercedes Geiger, Corey Grey, Jackie Kuro, Kaela Witmer, Teddy Mazaheri, Ben Eidemiller, Sara Hake, and Hannah Hess.